The smoky heat of chipotle peppers is absolutely fantastic on chicken wings. Instead of tossing my wings in a sauce I served them up ‘dry’, just coated in a delicious spicy rub where chipotle was the star, but there’s also hints of onion and garlic. Smoky chipotle dry wings will change your mind about always eating ‘wet’ wings. I served these smoky chipotle dry wings with just a bit of Ranch dressing, but these wings are just perfect by themselves without a dipping sauce. Also try my Buffalo ranch and Joe Montana dry rubbed wings. Place the wings into a resealable bag or container. Add 2 tablespoons of the smoky chipotle rub and the oil. Seal and shake well to coat. Let wings marinade for 1-3 hours. Transfer cooked wings to a bowl. Add remaining rub and toss gently to coat. 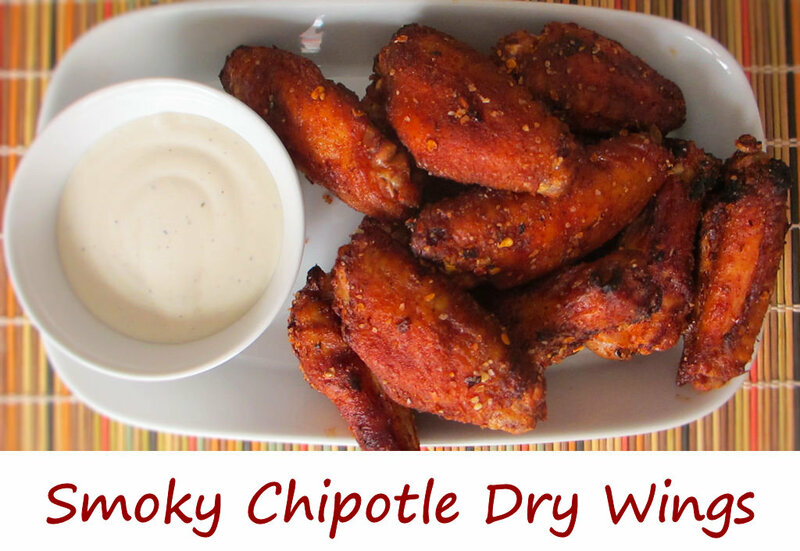 This entry was posted in Chicken Wings and tagged chipotle, recipe, smoky, Smoky Chipotle Dry Wings, spicy, wings by Mike. Bookmark the permalink.